'Its status of museum could be stripped off. Actually that status was given by a step taken with the mentality of the [Kenal Ataturk's Republican People’s Party] CHP. We can take that step taken by the CHP mentality back,” Erdogan declared. For centuries the largest and most resplendent cathedral in Christendom, Hagia Sophia was turned into a museum by the founder of the modern Turkish Republic, Kemal Ataturk, who brought sweeping secularisation to his country. Hagia Sophia is a UNESCO World Heritage Site and Russia’s Sputnik press agency, as quoted by the Athens daily Kathimerini , reported that sources at UNESCO said that the permission of a special committee is required to change the name of a monument. Erdogan’s comments come after the manifesto of the mass murderer who killed dozens of Muslims at two mosques in New Zealand, in which the terrorist stated that Istanbul will be renamed Constantinople and that the Turks will be limited to the Asian side of the city. The attack and hollow pronouncements of the terrorist have been exploited by Erdogan in delivering his Islamist nationalist message in what has turned out to be a tough campaign. “It is not an abnormal proposal. It is not something impossible, it could be done easily. We could even name it as the Hagia Sophia Mosque instead of a museum so that everybody can visit it without charge,” Erdogan said. Such a move is also viewed as an affront to Ataturk, who turned the mosque into a museum. “Its status of museum could be stripped off. Actually that status was given by a step taken with the mentality of the (Republican People’s Party) CHP. We can take that step taken by the CHP mentality back,” Erdogan declared. At a campaign stop in Istanbul, Erdogan called the city Islam bol (abundant Islam). “Constantinople will never exist again. The name of this area is Islam bol and you know that,” he said, declaring his intention to turn the monument into a mosque. “Recently, I was asked on television whether one will continue to pay to visit Hagia Sophia. I said no. We can establish free entry. What does that mean? 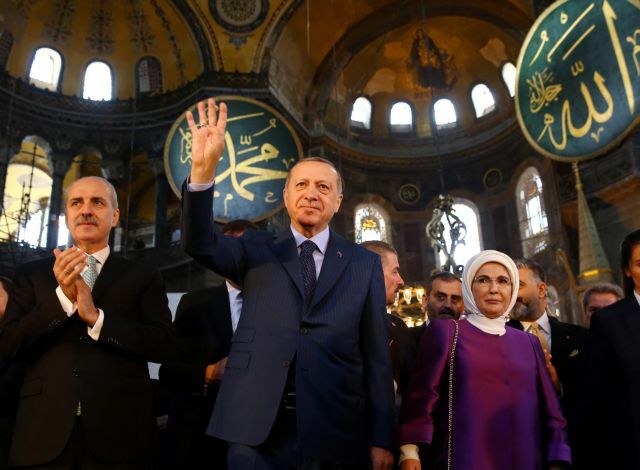 Not only will we allow free entry, but we shall after the elections abolish the word museum and make it the Hagia Sophia mosque,” Erdogan declared.